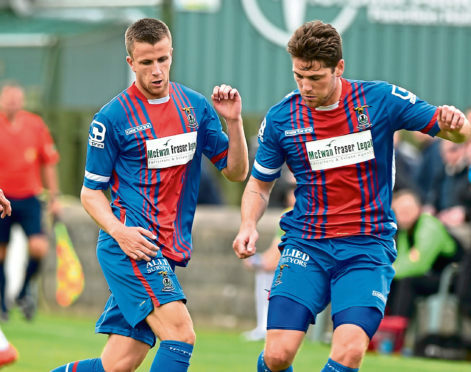 Liam Polworth, left, and Iain Vigurs playing for Caley Thistle in 2016 but they will be rivals this weekend. The stage is set for a thriller of a Highland derby this weekend and I cannot wait. There are so many subplots involved in the first meeting of Ross County and Caley Thistle this season and, while Saturday will not decide anything at this stage, there is no doubt victory for either side will strike a psychological blow. Inverness have been on a fantastic run and they head to Dingwall as Championship leaders. Victory at Victoria Park would put daylight between them and the Staggies and you can be sure John Robertson will be emphasising that fact to his players in the build-up this week. I watched Caley Thistle beat Partick 3-2 on Saturday and the first half was the best 45 minutes I’ve seen from any side in the division so far this season. Inverness were fantastic and were well worth their 3-0 lead. Partick, to be fair, rallied in the final half hour, scoring twice and missing a penalty. But for 60 minutes Inverness were rampant and showed what they are capable of. At County, Stuart Kettlewell and Stevie Ferguson have a wealth of experience of playing in the fixture but Saturday will be a new challenge for them. It’s much tougher standing on the touchline watching it all unfold. It will be interesting to see how the rookie duo handle it all but from what I’ve seen of them so far they seem to be doing just fine in the management game. The players I’ve spoken to love playing for them and they also seem to have a very good rapport with the media, which is important. If County win, they go top of the table again so there will no lack of motivation for what is always a feisty fixture without the added pressure of being a top-of-the-table game between the sides – and there are matchwinners in both camps. For Inverness, Liam Polworth is the key man for me, He has responded brilliantly to the abuse he and his family took from some fans a few weeks ago by really finding his form and becoming an integral part of the side. He is scoring and creating goals and I was hugely impressed by his performance against Partick. Robbo has pushed him up into a more attacking role, which has reduced some of the defensive duties which was probably his weakest aspect of his game, and he has become far more influential because of it. At County, Iain Vigurs will be relishing the chance to play against his former club. He is a fantastic footballer with a great brain and Inverness will want to keep him quiet on Saturday. Those two will have a big say in the outcome and, while a win or defeat will not matter too much at this stage, I’m going to enjoy watching it unfold.